Today, I came across two very different pictures. One an oil and the other a watercolour. Both lovely and yet very different in style. The oil painting is by Belgian artist Christian Frederick Beck 1876 – 1954. Beck is better known for his many early landscape paintings with motifs from the Randers area, and in recent topographic architecture pictures in which he especially cultivated motifs from Christianshavn.This picture is of the interior of Frelser Kirke (Our Saviours Church) Copenhagen. Signed and dated 1947. 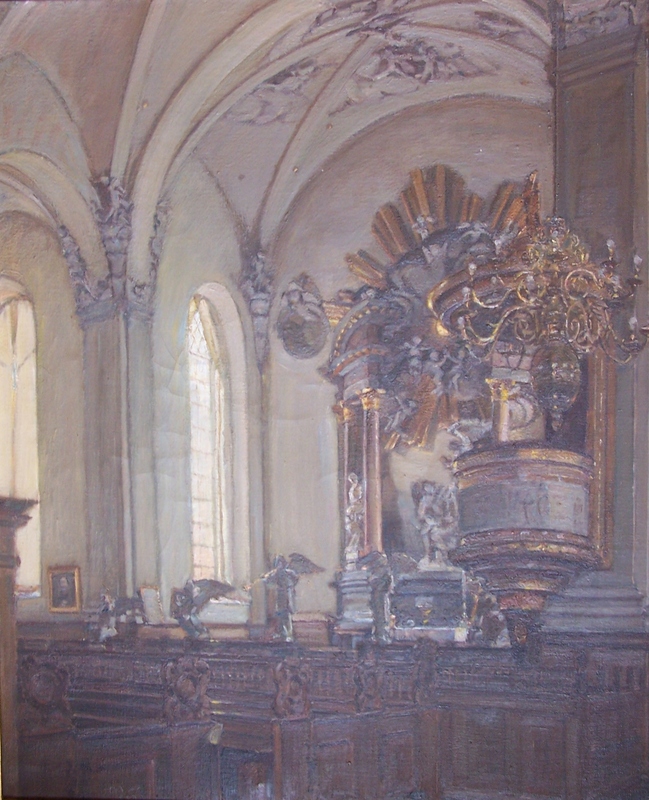 It shows the pulpit , pews and some of the alter designed by Nicodemus Tessin. The church is one of Denmark’s major tourist attractions with it’s twisted spire. It is a national treasure and a living parish church to some 8000 people. My second picture today is a street in Paris. A watercolour by the artist DRYZE and dated 1979. 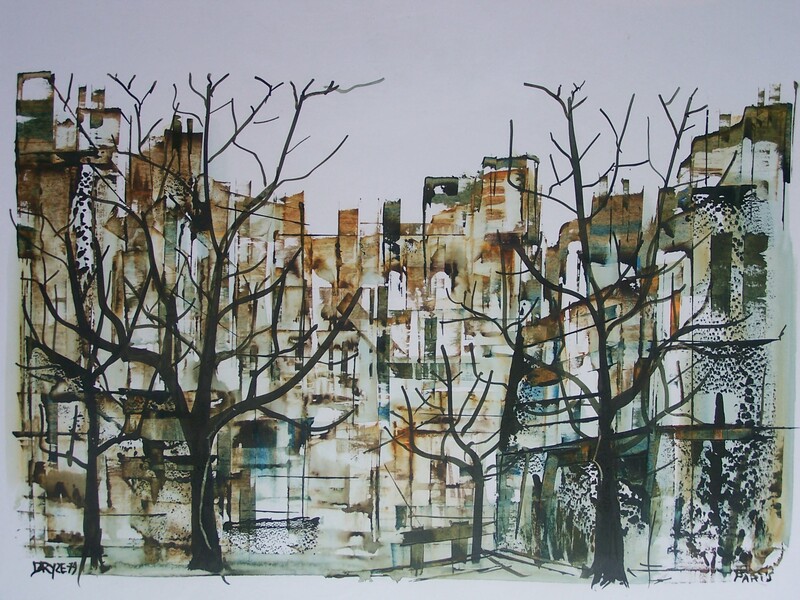 Depicting a Paris street in winter (hence the barren trees) its’ lines and colours convince one of the dull cold and yet with the expectation of life inside the structures pictured. A space awaiting its’ fulfilment, a space soon to awaken with life. Since posting this, I have been contacted by several people with information as to who Dryze was. His real name was Michel Frydzinski and sadly he passed away in 1990. For many years he lived off the Sacre Coeur near Place du Tertre where he worked in Rue Lamarck. He had a regular stall in Montmartre and painted scenes of the Normandy coast as well as his beloved Paris. He was French by birth and Polish by descent. An artist sadly missed but remembered through his expressive art. This entry was posted in Oil Paintings, Watercolour paintings and tagged alter, angels, apartment blocks, arches, church, cityscape, pews, pulpit, shops, trees. Bookmark the permalink. regarding the artist and will pass it on to you if I am successful. Bonjour . Je suis la coeur de Michel frydzinski. Mon frere est decede en 1980. Je suis tres heureuse de voir que Mon frere etait apprecie.a bientot d avoir de vous nouvelles. Thank you. Michel was a fine artist. I came across your query about Dryze which you posted in Aug 2012. I have started to research him but come up with nothing. I have a painting by him I purchased in Paris in 1983 which I cherish. Did you find anything about him? Just updated my blog in regards to the artist Dryze. Information should be of interest. have 4 by this guy . 78 & 86 love the style also. I have a painting by Dryze from 1980 when I was 20 on my first visit to Paris with my fiancee. It depicts the street leading up to Sacre Coeur in the background. I bought it directly from him on his stall on the streets on Monmartre. He said he used a palette knife to apply the paint. I wonder what happened to him. Im guessing this is possibly too late to reply, but Dryze was my uncle ! My mother (his sister Francoise) googled his name out of pure curiosty. His name is actually Michel Frydzinski and he sadly passed away years ago, and is sorely missed by us all. His mother Nathalie is still alive and living in a town not far from Paris. We visit her often. We have many of his wonderful paintings hanging on our walls and in my Nannys house. Its heart warming to know he is not forgotten and his wonderful paintings still live on. He was an amazing character and loved by many. If you want any information please dont hesitate to ask. Thank you for the information. I have just updated my blog chapter on your uncle, Michel Frydzinski. Hello my name is Francoise Pearce nee frydzinski. I read your comments.they touched me.sadly my brother passed away 25 years ago.I’m so happy you appreciate his paintings.best regards. Thank you. Your brother was a fine artist. Did anyone find out more about DRUZE or how paintings? Also have a Paris street scene done in 1980. Beautiful work! Just updated my blog chapter on Dryze. Should be of interest. Just updated my blog chapter in regards to the artist Dryze. Should be of interest. Michel Dryze was my friend in the early eighties, 33 years ago. He must have been in his late forties, early fifties then. He lived just off the Sacre Coeur near Place du Tertre where he worked, in the Rue Lamarck. I cannot find anything online about him, he might have passed away or moved abroad. i have one painting by him and it is very dear to me. Thanks for the information. I will update my blog chapter in regards to Michel. I met Michel on the place du tertre when he was working there. I looked him up whenever I visited and have been to his house for dinner. I was an aupair at the time. I bought one of his paintings. I remember him fondly but do not know any of his other friends. I can shed a little light, as Dryze was my wife’s uncle, Michel Frydzinski (1946-1990). He lived & worked in Paris around 1975-1990, where he painted many scenes and had a regular stall in Montmartre. He also liked to paint scenes on the Normandy coast. He was French by birth and Polish by descent. My wife’s family speak of him with very fond memories and he is much missed. It is lovely to see people beyond his family still enjoying his work. If anyone who posted the previous messages some 4 years ago is reading, do feel free to ask me any questions and I will answer if I can. Thanks for the information. It is of interest to myself and others.